Pounds per square inch, or psi, is the English unit of measure for pressure. The pound serves as the measure of weight or force, and the square inch is a measure of area. Therefore, psi measures the amount of force in a given area, and force and area have an inverse relationship—as the force increases, pressure increases, whereas as the area increases, pressure decreases. PSI indicates the amount of pressure in a volume. Pounds per square inch indicates the amount of pressure imposed on an object, as well as the maximum amount of pressure an object can withstand. For example, a tire may be inflated to 26 psi, but the maximum pressure the tire may withstand is 40 psi. Furthermore, a concrete footing may carry a load of 2,500 psi, but the maximum pressure the concrete can hold is 3,000 psi. Pounds per square inch is used in combination with other English units. For example, psig, or pounds per square inch gauge, is a measurement of pressure relative to the ambient atmosphere. The pressure exerted by the atmosphere at sea level is 14.7 psi. So, a tank pressure reading 200 psi at sea level is actually 214.7 psig. Another related unit is kilopounds per square inch, or ksi: 1 ksi equals 1,000 psi. Architects and engineers use this unit is used to calculate material stiffness versus stress. A pound is often equated with a kilogram, which is a unit of mass; however, the pound measures weight. Weight is a force composed of mass times the acceleration of gravity. 1 psi is equal to 6,894 pascals (Pa). 1 psi is equal to 0.06894 bars (bar). 1 psi is equal to 0.06805 atmospheres (atm). 1 psi is equal to 51.72 millimeters of Mercury (mmHg) or Torrs (Torr). Pounds per square inch may sound like an obscure engineering or scientific measurement, but it crops up in everday life. For example, a bike tire should usually be pumped to 80 psi; storms drop the atmospheric pressure below 14.7 psi. Scuba tanks are commonly filled to 2,500 psi. 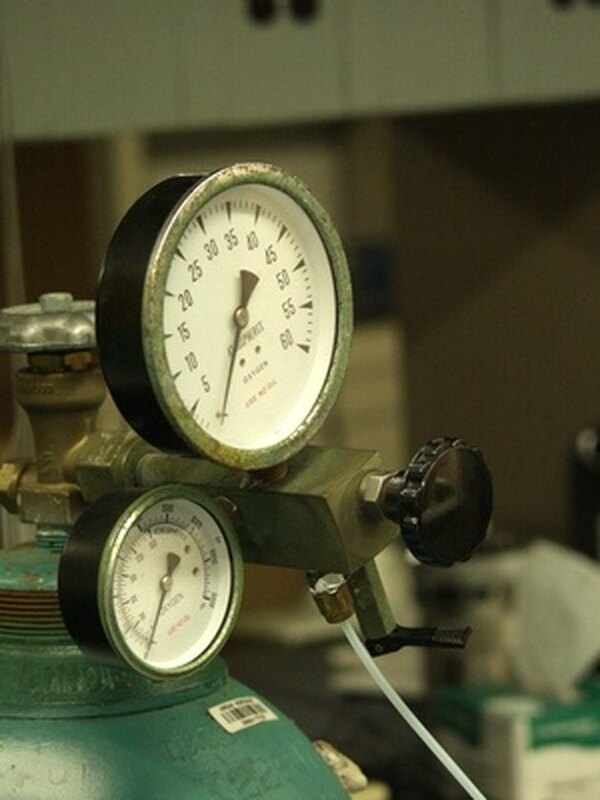 Furthermore, oil gauges measure the pressure of the oil in an automobile engine. If the oil pressure gets too low or high, it damages the engine.